Looking for a complete breakfast that you can make in one pan? These breakfast casseroles are the answer. From sweet french toast bakes to savory bacon, egg, and cheese casseroles, we've found something for everyone. Great at your next family breakfast, brunch celebration, or breakfast-on-the-go these breakfast casseroles can easily be prepared and baked ahead of time, then reheated. This breakfast casserole has it all: eggs, toast, sausage, and cheese. Combined together, this dish is one of the ideal make-ahead breakfasts. The recipe calls for a spicy chicken buffalo sausage, but you can use any precooked sausage that you like! Spice up your breakfast casserole with this easy cast iron pan shakshuka. It's a traditional North African breakfast that is becoming popular all over the world. The base is a spicy tomato sauce and it's topped with chorizo, freshly cracked eggs, and crumbly cotija cheese. It's super customizable - make it as spicy or as mild as you like! Strawberries, Nutella, cream cheese, and croissants make for a wonderfully decadent breakfast. It's rich, chocolatey, and full of fresh strawberries. Perfect for a romantic Valentine's Day breakfast or anniversary, it also looks beautiful on a bridal or baby shower brunch table. Frittatas are a classic Italian breakfast casserole that you can really eat any time of the day. Think of it like a crustless quiche. Just slice it up and eat it hot or cold. This one is filled with peppers, shallots, and mushrooms. You can easily prepare it and bake it ahead of time, since the individual slices reheat so nicely. If you don't have peppers, shallots, or mushrooms, use whatever leftover veggies you have on hand. 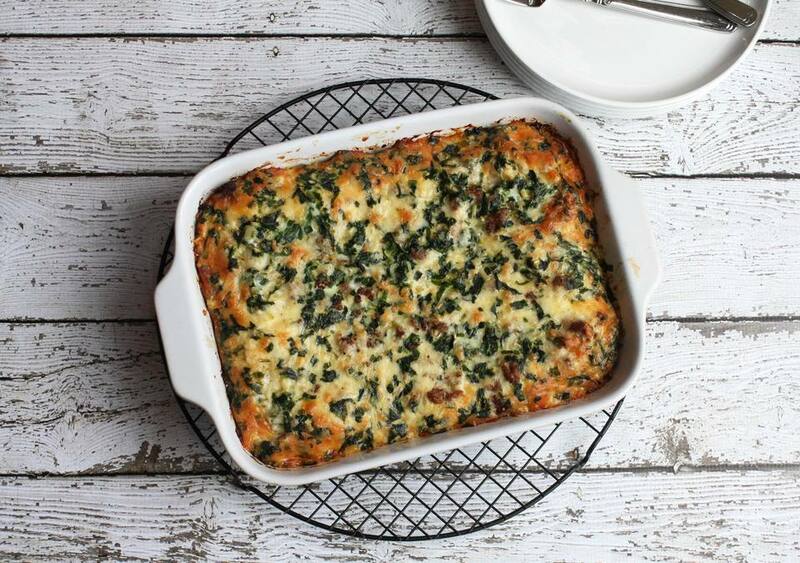 Zucchini, spinach, onions, and even potatoes or leftover pasta can be thrown into this dish! 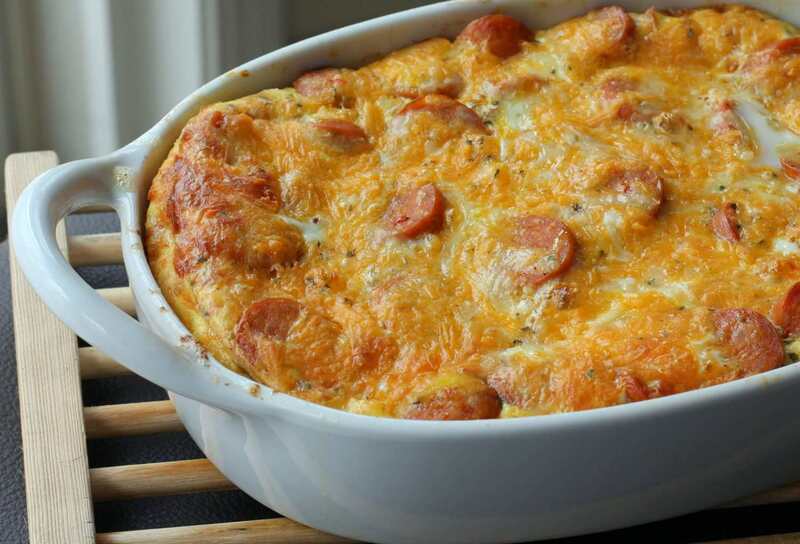 This delicious breakfast bake is based off of the classic Denver or Western Omelet. Loaded with ham, peppers, onions, and cheddar cheese, it's super easy to whip this casserole together. Just be careful if you're storing it in the refrigerator before you bake, because it can spill over the sides of the casserole dish when you're taking it in and out of the fridge. If you're looking for a unique and spicy breakfast casserole, then look no further! This sweet potato based breakfast casserole is sweet, savory, spicy, and most of all, delicious. Feeling a little fancy? Top it with sliced scallions and extra hot sauce for a beautiful presentation. Ramp up your breakfast game with this breakfast casserole featuring hearty sausage and garlicky ramps. Ramps are delicious and are a great alternative to onions or scallions. Use any kind of sausage you like, but pork sausage compliments the ramps nicely! Nothing beats a pile of bacon and eggs for breakfast with your family. This bake is a complete meal, starting with a bread base and then topped with crispy bacon and creamy eggs. Crockpot hash browns are so versatile. They can be served at breakfast, lunch, or dinner. Easy to prepare ahead of time and keep stored in the fridge for weekday meals, they are an amazing creamy, crunchy side that's hard to resist! Blueberry Dutch babies are the easiest pancakes you can make. Whip up the batter, pour it into a buttered casserole dish, and pop it in the oven! If you're not feeling up to blueberries, or just looking to change things up, swap out those berries with raspberries or blackberries. Then top it with powdered sugar, maple syrup, or even whipped cream. Fiesta egg casserole is full of Tex-Mex flavor with lots of pretty bell peppers, cheese, and spices. It bakes quickly and will be on your breakfast table in no time! French toast doesn't get any simpler than this overnight casserole. It's decadent, but bakes up so light and fluffy. Add berries, maple syrup, or whipped cream for a beautiful finish! Strawberry shortcake for breakfast? Yes, you read that right! It's a cross between a French toast casserole and a cake. While this recipe features rich brioche bread, you can absolutely substitute it with biscuits or a nice French bread. Migas are the breakfast casserole you didn't know you've been missing out on. Made with leftover corn tortillas, eggs, and salsa verde, migas are crunchy, soft, spicy, and tangy all at the same time! It's a very quick casserole that is actually made on the stovetop in one cast iron pan. You can also crisp it up in the oven when it's almost done cooking! What's better than fluffy biscuits for breakfast? Fluffy biscuits that are combined with sausage and eggs, like in this easy and simple breakfast casserole. Using frozen or refrigerated biscuit dough makes this recipe super quick and fuss-free. You can also substitute the biscuits with thick breads like brioche, croissants, and challah. The perfect all-in-one breakfast, serve it alongside a nice fruit salad and a hot cup of coffee for a great way to kick off your day! Pre-made, shredded hash browns make this casserole so easy to throw together. That, and the part that you get to use the crockpot, so you can set it and forget it until it's time to eat. This crock pot breakfast casserole reheats well and can be kept warm in the crock pot for several hours. Perfect for brunches and baby showers or bridal showers! If you're craving something sweet for breakfast - because let's be honest, who isn't -then this Bananas Foster French Toast casserole is the breakfast for you! It's loaded with delicious rum and banana flavor and is topped with lots of fresh whipped cream, instead of the traditional ice cream. Though if you used ice cream instead, we wouldn't judge you! You may be used to Chile Rellenos for dinner, but have you thought about it for breakfast? We happen to think it makes for a deliciously spicy and savory breakfast treat. There's no messy breading or frying and you can just use bread as a base and layer all of the traditional ingredients on top! Ta-da! Savory pancakes make for an excellent breakfast or brunch dish. Bacon and creamy fontina cheese make this pancake super hearty and full of flavor. Switch up the recommended cheese for gruyere or even mozzarella and add a little dijon mustard for some delicious zing! Grits are a traditional southern favorite for breakfast. In this dish, they are the creamy, salty, and decadent base for eggs that you've been missing from your life. Just pop it in the oven for 20 minutes and you've got a hot and delicious breakfast with some southern flair!